We each have our own poignant story to share and understand. Here is mine, told and retold many times in many different ways. When we arrived home from China and the front door to our home finally closed , leaving my daughter and I - baby and mother - to begin our lives together, I was both scared and excited. Those of you who have been through this know what I mean. Becoming an instant parent without 9 months of going in the same direction in the same body can be a shock to the system! Then think on those parents who adopt older children , school age and teenagers - when adoptive parent and child finally decide to live together it is a colliding of worlds and histories and rhythms and cultures and sometimes fully formed personalities. Adoption is certainly not for the feint hearted and it is definitely the right thing to be doing for a lot of people. It can be very rewarding to both parent and child given time and patience and love. As an adoptive parent in 2001, there were no post-adoption professionals to help support my journey as an adoptive parent. The adoption agency had been supportive on the road to adoption and now except for the final check up visit from the social worker, that was it. In the beginning I had begun reading many books about adoption, most of which I stopped reading as they scared me with worst case scenarios. The books that were most important for me to read, and are still important were the books about Chinese history and culture. I did not have someone to give me reassurance when I had questions or fears about my baby’s development or the possible impact of her first months of life in the orphanage. I had friends who had also adopted children, that was helpful. The best advice I was given by one of these friends ,was to follow the lead of my daughter and not impose on her whom I think or want her to be. Another perspective that helped me was to see myself as Guardian of this precious child. So I decide to just begin, by closely following the non-verbal cues of my daughter and responding the best way I knew how to become her parent. She taught me to slow down; deal with my anxiety and to trust my instincts. We got to know other adoptive families and we joined a nursery school co-op. 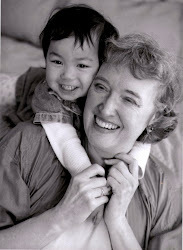 Professionally, I became an advocate and therapeutic support for adopted children and their families.